New Concept? 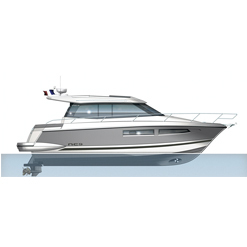 The success of the new NC line has made an impact in the world of Jeanneau. 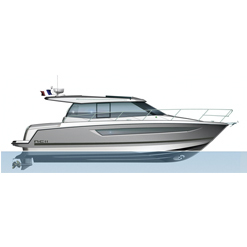 The original driving spirit behind the concept, “an apartment on the water, with a terrace and a sea view”, has been perfectly distilled into the NC 9 and NC 11, resulting in real enthusiasm for these “new” boats. On the heels of this success, Jeanneau is bringing the concept to the new NC 14, aboard which luxurious elegance and comfort are matched by innovation. With a remarkable design by Camillo and Vittorio Garroni, the NC 14 is assertive, with pure lines, sober volumes, and an unforgettable contemporary style. Daytime living spaces, including a dining area and a very attractive galley, are arranged around a very spacious deck saloon and feature a floor plan designed on a single level. Accessible by a comfortable corridor, the evening living spaces offer surprising volume in the cabins, the head and shower compartments, and a true walk-in closet. High-quality materials and a warm ambiance distinguish the interior decoration. Characteristic of the NC line, the cockpit is open to the saloon and to the steps to the sea. Well protected by a large sunroof, it is the ideal place for rest and relaxation. and comfort to a level never before attained.